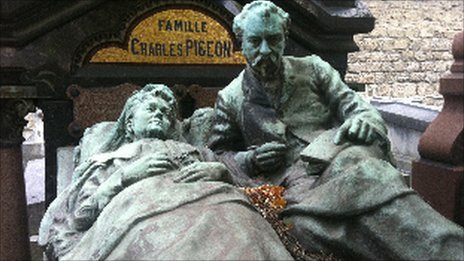 Paris is well-known for its cemeteries, the most famous being Pere Lachaise, where tourists seek out the tomb of Oscar Wilde. But I live next to another great 19th Century cemetery in Montparnasse – and when I go there I always take my phone. “The ancients attributed mystic powers to any reflective surface, solid or liquid, because the reflection was considered part of the soul.” It was taboo to disturb waters on which a person’s reflection was present. Shattering their image was considered damaging to the soul. Thus, our breaking a mirror equals seven years of bad luck, a creepy notion I believed in as a child but since have put aside. Narcissus, the fabled self-love obsessed nymph, has been misinterpreted to be a dude who could not get enough of his own reflection, and so pined away and died (or did he fall in and drown?). Echo was the Goddess of death-by-water, who lay in wait to seize one’s reflection-soul, a belief among the Africans and Melanesians. Mmmmm….does that mean that if no intelligent beings perceived it, the universe would not exist at all?